Remember in math class when you had to multiply the diameter of a circle by a number called “pi,” approximately equal to 3.14, to get the circumference? Maybe you’d rather not remember that. But don’t underestimate this number. 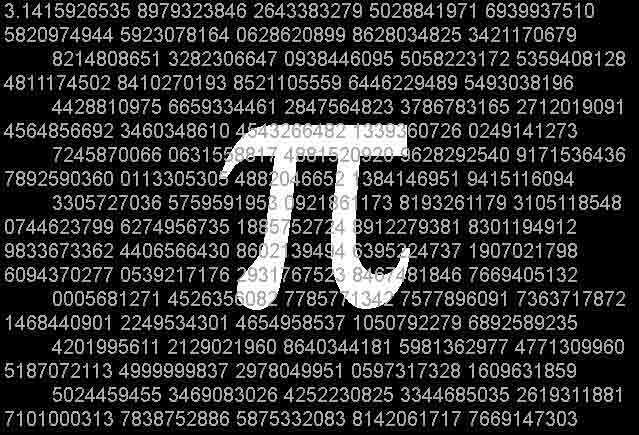 Pi has captivated the human imagination for thousands of years, and will be celebrated during Pi Day, observed on March 14, 3/14. Before you join the math fest, take note that you can’t calculate pi on your cellphone. There are approximations like 22/7, but no simple fraction will give the exact number. And while great mathematicians throughout history toiled over uncovering more digits, pi doesn’t stop at 3.1415926535897932384626. These digits continue infinitely in an apparently random pattern that will never repeat. More than a trillion digits have been found so far, according to the Web site for the indispensable book The Joy of Pi. Pi Day offers a fun reason to learn more about this fundamental constant and, of course, eat more pie. The Exploratorium in San Francisco will hold pie tossing events, along with educational lectures, on Pi Day. Other Web sites like TeachPi.org give suggestions for pi activities in the classroom. If you have a knack for remembering things, try memorizing pi. The number’s mysterious, infinite string of digits has inspired some people to take up memorization as a sport. The current world record holder for memorizing pi is Chao Lu of China, who recited 67,890 digits from memory in 2005, according to the Pi World Ranking List. Pi has also inspired poets, artists, and musicians. A poem called Poe, E: Near a Raven encodes 740 digits of pi, where each word represents a digit based on the number of letters in that word. Try that technique: see, a nerd a month considers pi. Before you start writing, memorizing or baking, you’d better look the part. Web sites such as ThinkGeek sell pi attire. Givenchy even markets a perfume called Pi. And don’t forget to wish Albert Einstein happy birthday. The physicist would turn 129 years old on this year’s Pi Day. The things mathematicians get excited about... 😆 I suppose it is a pretty vital number. It's interesting seeing all the different things people are getting up to, though I don't think I'll be able to beat 67,890 digits. this came from nor who did it. while not forgetting phi, the golden ratio ,.. that other great number discovered in antiquity and an inspiration for many throughout time. Pi day is one of my favorite non-holiday days of the year. First of all, it's the birthday of my favorite scientist and all-time hero: Albert Einstein. Michael Caine was born on Pi day. So was Billy Crystal and Kirby Puckett. It's also one day before the Ides of March. That's probably a meaningless observation but whenever Pi day comes around, I think of the Ides of March. In circumstances where precision is not terribly important, 3 is indeed the best one-digit approximation of pi. When people use their own arms to measure cubits, for example, 3 is close enough. Many people, like Bubba, mistakenly assume that this 3 is the same as 3.0. It certainly is not. It names a range of about 2.5 to 3.5, which includes the true value of pi. 3.0 however, names only the range of about 2.95 to 3.05, which does not include pi. My cat's name is Pi. Nothing worse than a number with no absolute value, it just keeps going and going. Would never be so cruel as to ask my computer to calculate the absolute value of Pi.